« « SHOT Show 2007 – We Need Your Help! I was answering questions from the audience during my recent AOPA Expo seminar, “Equipping Yourself to Survive – Personal Survival Gear for Pilots” when I was asked about exploding lithium batteries in view of my point that I recommend non-rechargeable lithium batteries over alkaline in survival gear like flashlights. I recommend them because they have a much longer shelf life (10 years), generally run longer, work much better at cold temperatures and weigh less. I pointed out that all the recent coverage of lithium battery problems related to rechargeable lithium cells in computers, not primary (non-rechargeable) lithium batteries like we were discussing, and they have different construction and chemistry. Moreover, I mentioned that I didn’t personally know of any failures of primary lithium batteries in flashlights and the like. At which point a pilot in the audience told me he had not only had such a failure recently, but had the flashlight and battery with him. I invited him to lunch and we reviewed his experience and took a look at his failed gear. The photos below were taken at lunch. I purchased a Brinkman Flashlight (plastic body and made in China – Ed.) and it came with a set of lithium (123-cell) batteries. When the original batteries ran down I purchased new lithium (non-rechargeable – Ed.) 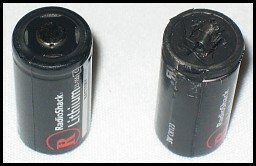 batteries from Radio Shack (made in China – see photo above – Ed). I did not have the new Radio Shack batteries in the flashlight very long when the flashlight failed. I had turned the flashlight on while beginning my preflight checklist in the cockpit, that morning before sunrise. I used it again while inspecting the engine and checking the oil. I laid the flashlight down on the wing while it was still on and proceeded to sump the engine and left tank (checking for water in the fuel – Ed.). I picked up the flashlight to illuminate the cavities in the empennage and found the light to be off. I attempted to turn the flashlight on, but it did not work. I remember being irritated that the batteries were no good after such a short while. I should have trusted my gut feeling that it was highly unusual for the batteries to fail and that perhaps there might be more to the problem than simply expired batteries. I believe now that somehow the flashlight malfunctioned and had developed a short. I placed the flashlight in a side pocket of my nylon AOPA flight bag, lens end up, and placed my flight bag in the back seat of the airplane (PA28/140 – Piper Cherokee). About 10 minutes later while I was preparing charts and waiting for my instructor to arrive I heard what sounded like something had fallen, perhaps off of the glareshield (dashboard) to the floor. I looked all around and when I could not find anything I looked inside the engine compartment again with a spare flashlight and found nothing. I continued with my preparations to fly. I now surmise that the “thud” sound was perhaps a buildup of gas in the flashlight causing the head of the flashlight containing the bulb to perhaps dislodge past the threads of the flashlight top. In the future I will trust my senses (the sound of something falling) and be painstaking about finding the cause. However, I don’t know that I would have found anything unusual with the flashlight. Shortly after take-off, within 10-15 miles of departing KVGT (North Las Vegas airport) my instructor and I heard a very loud “POP” followed by the cabin filling with smoke having an “electrical” smell. It seemed to us that something had hit the passenger side window from outside the aircraft, yet it was evident the problem was inside the aircraft. My instructor took the controls, I declared an emergency with KVGT and opened the vent window as it was instantly difficult to breathe. Almost immediately thereafter we realized all the electronics were operative and that whatever was going on was coming from behind the front seats. By this time we are on short final, the aircraft was under control, the cabin had cleared of smoke and I begin to investigate the rear seat. I found the flight bag, where the flashlight was, melted and on fire with a 3-4 inch blue-yellow flame. I immediately extinguished the fire. The “POP” we heard was the top of the flashlight exploding off the flashlight and slamming into the passenger’s window behind the instructor’s seat. The top lithium battery had exploded at the top of the battery. I believe from the moment the flashlight was inoperative it was in a state of build-up for what eventually was an in-flight cockpit fire. I estimate 30-40 minutes from the time the flashlight malfunctioned until it fully exploded. This set off a bit of research to see what I could find out, both on the Internet and with calls to engineers working in the flashlight industry. A check on CandlePower Forums revealed a few instances of exploding batteries and lots of discussion and some research. Just search on “exploding batteries.” My discussion with the experts revealed some valuable information. First off batteries have been “exploding” for a long time, even before lithium batteries came on the scene. The difference is the lithiums often are higher voltage, store and generate more power, thus more heat and more pressure, the gas generated is more volatile and potentially will vent a flame in extreme situations or if there is a spark can explode. In any case, it’s important to put it all into perspective. There are millions and millions of these batteries in use today, but the reported instances of primary (non-rechargeable) batteries exploding are extremely few and rare. Many reports online appear to be about the same instance, so appearances can be deceiving. Moreover, in some of the reports it isn’t clear that some outside easily avoidable influence might not have caused the problem (mismatched batteries, mechanical short in the light or switch, etc.) and there is often a question of where they were manufactured. 1. More reports of problems with primary (non-rechargeable) batteries seem to have occurred with Chinese-made batteries than U.S. There appear to be serious questions about both the general quality of the Chinese batteries and questions if some actually incorporate the required safety valve. Japanese primary batteries fare better, though there were reports of Panasonic 123-cell battery problems. 2. It appears that plastic flashlights are more prone to exploding or having the head blown off than aluminum bodied flashlights which seem strong enough to generally contain the pressures with only minor damage. 3. There were more reports of issues with lithium 3-volt 123-cells than 1.5 (actually 1.6 -1.7) volt AA-cells, but I suspect that’s at least partly influenced by the fact that the 123-cells are more common in flashlight use than lithium AA-cells and generally used in higher performance flashlights. 4. I may well have missed them, but I was unable to find an instance of a single-cell flashlight having such problems and my experts agree. 5. I also found no evidence of these problems with the small lithium coin cells as used in key chain size flashlights such as the Photon lights and my experts agree. So, what can you do to prevent problems? Herewith, some suggestions. They apply to all batteries, but are especially critical for lithium primary (non-rechargeable) batteries. 1. USE ONLY BRAND NAME, AMERICAN MADE PRIMARY BATTERIES. I personally use SureFire 123-cells and Energizer AA- or AAA-cells. Japanese made batteries may be an alternative. DO NOT USE CHINESE MADE CYLINDRICAL LITHIUM BATTERIES. 3. NEVER MIX OLD AND NEW BATTERIES. Always remove and replace all the batteries in any device at the same time. Always replace the batteries with batteries from the same package or with the same expiration date. You want to avoid at all costs batteries that have unequal charges. This appears to be the single quickest route to a problem according to my experts. Again, NEVER MIX OLD AND NEW BATTERIES. 4. Use only high quality flashlights and for lights incorporating multiple batteries, especially multiple 123-cells, consider sticking with an aluminum bodied light. Avoid “bargain” lights, especially Chinese made knock-offs of better lights. Too many I have seen appear to incorporate design and manufacturing shortcuts that compromise the end product’s robustness, no matter that they look similar to higher quality (and higher priced) flashlights. That’s not to say you can’t get reasonable quality in an affordable Chinese made light, there are quality Chinese made lights out there, just be sure that’s what you’re getting. A common household brand name is no guarantee of quality in this regard, look to see where it is made and, finally, consider that if the price is too good to be true, it probably is. 5. If you stick with single-cell lights, as far as cylindrical cell flashlights, it appears you are far less likely to have a problem. 6. Did I mention sticking with QUALITY flashlights and U.S. made lithium batteries and not mixing batteries? 7. Listen to your gut. Not specific to batteries or flashlights, but my experience is similar to the pilot above. If my gut is telling me something isn’t right, I will usually regret ignoring it or not pursuing it until I find the source of whatever got my attention initially or is causing my unease. I will continue to recommend primary non-rechargeable lithium battery powered flashlights and survival equipment. I am not getting rid of my Surefire lights or other lithium battery powered lights or gear. Their advantages are too many to be put off by what appear to be easily avoidable problems that at worst are extremely rare. Buy quality gear, use quality batteries, use them properly and as designed and don’t worry. If you want to comment on this article, please do so in this thread on The Survival Forum on ETS. Exploding Lithium Flashlight Batteries? was written on November 24, 2006 and filed in Gear, News.